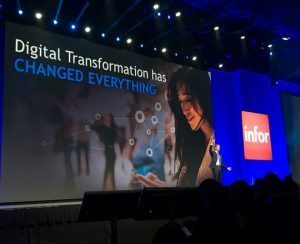 The keynotes at Inforum Day 3 were all about customers—the success of Infor’s customers and the importance of experience for customers of all kinds. Digital agency Wunderman found that 79% of B2B buyers will only consider doing business with brands that show they understand and care about each customer’s needs. McKinsey reported that 70% of buying decisions are based on how well customers feel they’re understood by vendors. Forrester Research says that 64% of B2B customers say the buying experience is a more important decision factor than price. To set the tone, Infor kicked off the day by presenting the winners of the Progress Makers Awards, the company’s recognition of outstanding customer success in areas like financial excellence, transformation and innovation. Reading Health Systems was honored for automating a manual replenishment process and cutting picking times by two-thirds while increasing availability of needed systems for physicians. Kempinski Hotels used Infor financials to improve forecasting accuracy by 88% while also streamlining approvals and boosting accounting productivity. Foot Locker applied Infor Talent Science across its brands in 28 countries to substantially reduce employee turnover and thus improve store productivity. HealthlinkNY used Infor Cloverleaf to reduce average patient emergency room visits and hospital stays by 7% and readmissions by 4.5%. Lord Abbett & Co. applied Infor Sales Intelligence for CRM to increase cross-sales five-fold and prospect conversion rates by 1,000%. Customer of the Year Bank of America used Infor to improve scheduling optimization for 50,000 employees at 5,000 locations, increasing employee satisfaction with the scheduling process from 40% to over 90%. These success stores are all part of the bigger task of building what Infor Chief Creative Office Marc Scibelli called a “digital backbone,” which consists of an integrated set of services that enable companies to pivot in anticipation of market change. One customer that’s well along the way is Brooklyn Sports & Entertainment, which manages and controls the NBA’s Brooklyn Networks and that team’s Barclays Center home stadium. Infor is working with Brooklyn Sports on player performance monitoring using connected Internet of things sensors on players’ jerseys. This project is not only improving player performance but creating new training regimens and drills that contribute to player wellness. It’s all tied in to a bigger analytics platform that can be used for real-time decision-making during a game. On the fan experience level, Infor and Brooklyn Sports are integrating predictive analytics, loyalty programs, individual fan profiles and inventory logistics to optimize its concession services—so food rarely runs short—and to make brand ambassadors of the most passionate fans. Legacy applications, particularly those that have been modified by hand, hold back this kind of agility. Norman Bell, group strategy director at Infor customer Travis Perkins, said lack of integration used to frustrate his company’s efforts on its digital transformation journey. “We’re good at ideas and initiatives, but they often weren’t realized, and a big factor was the core platform we had for many years,” he said. Since migrating to Infor, Travis Perkins has automated many basic information services for its home improvement customers, delighting them in the process. Clad in a checked shirt and fashionably torn jeans, Esposito led a fast-paced demonstration of what’s new and what’s coming in the Infor user experience, with mobile, chat, and personalization leading the way. Applications enabled by Infor’s new Coleman artificial intelligence platform will “generate alerts, tasks, and assignments that reflect the right access to data at the right moment,” he said. Coleman is aware enough to interact with the user via chat, voice, images, and even files. It constantly scans each person’s information streams to surface the most relevant information. For example, a sales rep visiting a customer on site will get a stream of background about that account as well as supporting materials needed to make the sale. Data will be presented in a format that fits the device the rep is using and will even take the rep’s physical location into account. Infor is also adopting technology similar to Facebook’s social graphing technology to better understand connections within its customer company to understand how they can lead to faster answers and better teamwork.